There are fewer holidays that I like to decorate for more than Halloween. 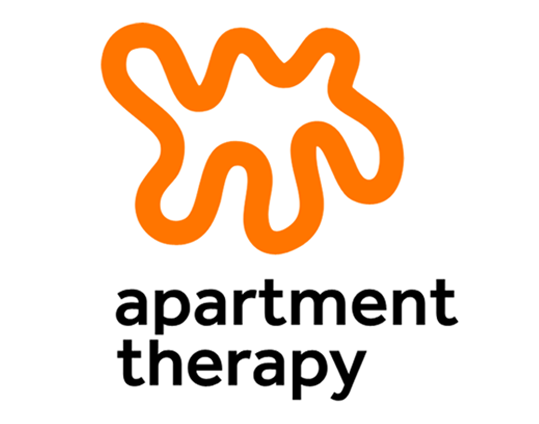 While, I’m not really one to dress up in costume or frequent haunted houses, every October I look forward to pulling my pumpkins, skeletons, and things that go “BOO!” from storage to ‘haunt the halls’ (as opposed to decking them). 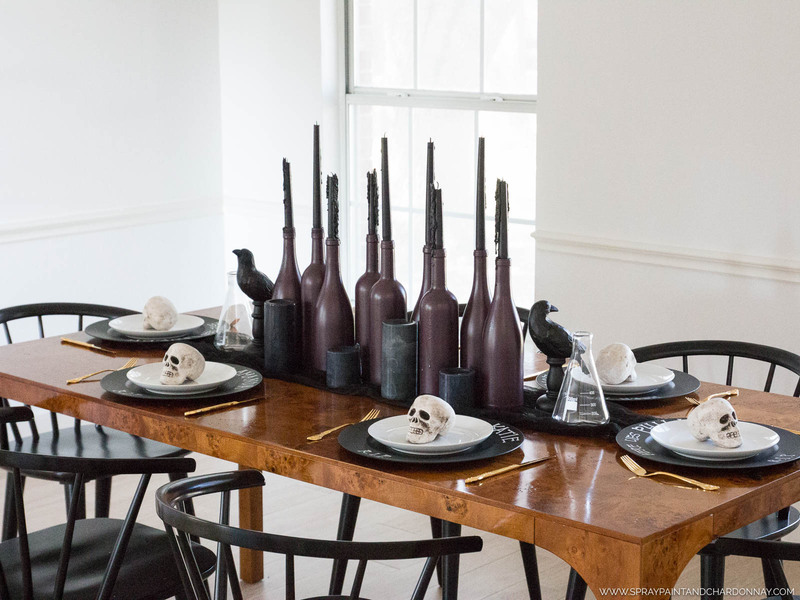 Decorating this year is especially exciting because I finally have a formal dining room to spookily spruce, and I worked with my favorite spray paint, Krylon® Brand, to create the perfect table setting for a frightful feast with friends. 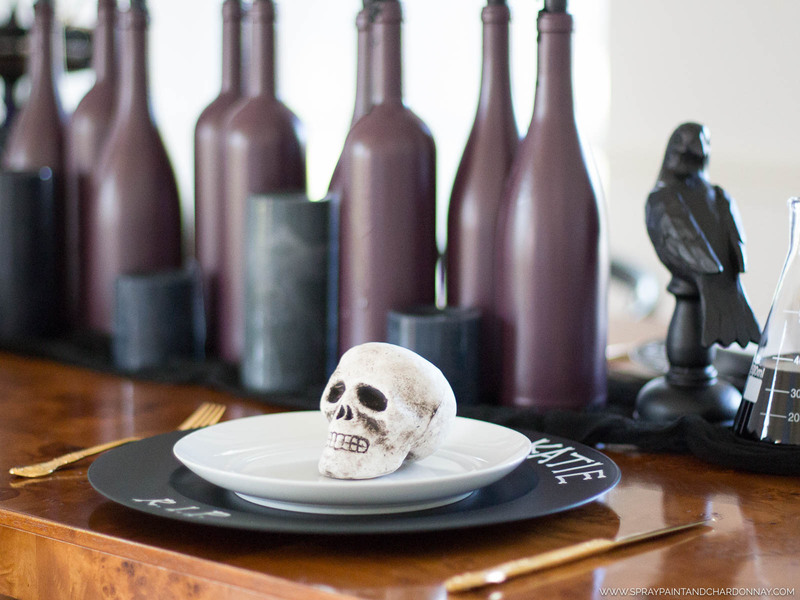 When it comes to Halloween decor, I’m typically drawn to all-black-everything, but this year I’m switching it up by adding in a little pop of creepy color with a deep purple. 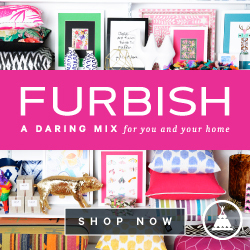 Each of these projects are incredibly easy and require very few supplies, most of which you likely already have at home. To remove the labels from the empty wine bottles, I let them soak in warm, soapy water in the sink for about an hour. After that, the labels should easily scrape off with your fingernail, but I also used a spatula to help with the more stubborn ones. I then wiped the bottles off to remove any excess tackiness from the label adhesive and let the them dry outside, upside down. Once the bottles were completely clean and dry, I read the label on the can for safety and application instructions. After giving the Krylon® ColorMaster Paint + Primer in Bordeaux Matte a good shake for a minute or two, I sprayed each bottle with one coat, using light, sweeping strokes to prevent dripping. This paint is dry to the touch in about 10 minutes and is safe to handle after an hour. Also, can we take a minute to acknowledge how appropriate the paint color is for this project?! Bordeaux! It’s meant to be. 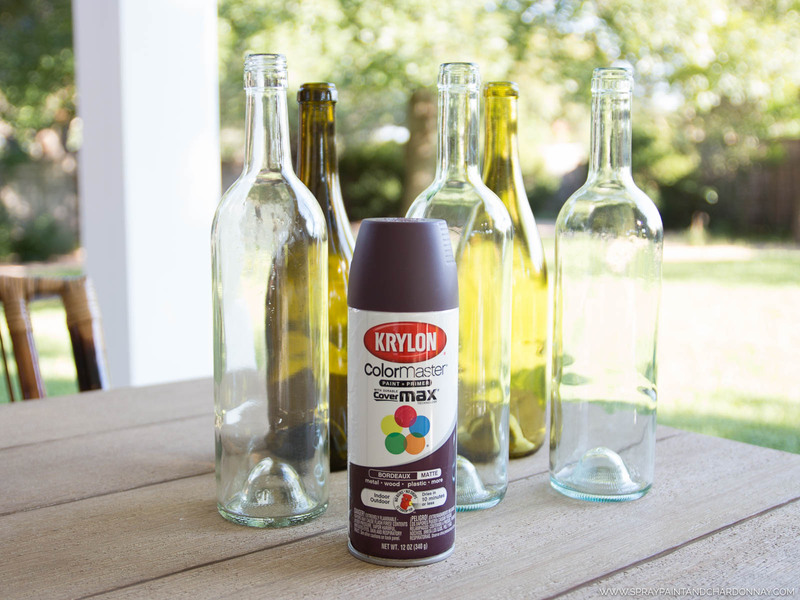 Once the bottles were completely dry, I staggered them down the middle of my dining table on a black cheesecloth table runner. I then put black candle tapers in each bottle, really twisting the candle in the spout of the bottle to ensure that they wouldn’t fall over (safety first!) 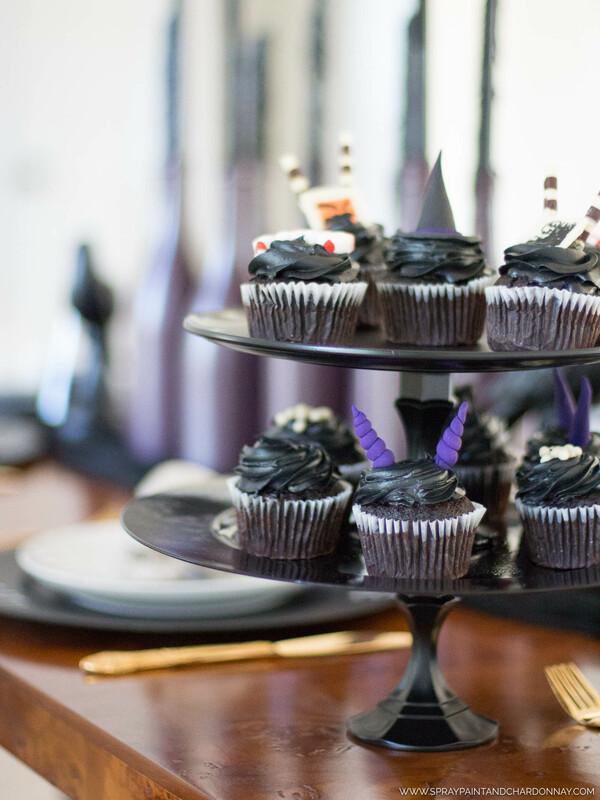 For an extra spook factor, you can light the candles an hour or so before your guests arrive so that the wax can drip down sides. Always keep an eye on your lit candles, as spray painted surfaces aren’t suitable for direct flame contact. After wiping down the chargers to make sure they were clean, I laid them out on a piece of cardboard in the yard. 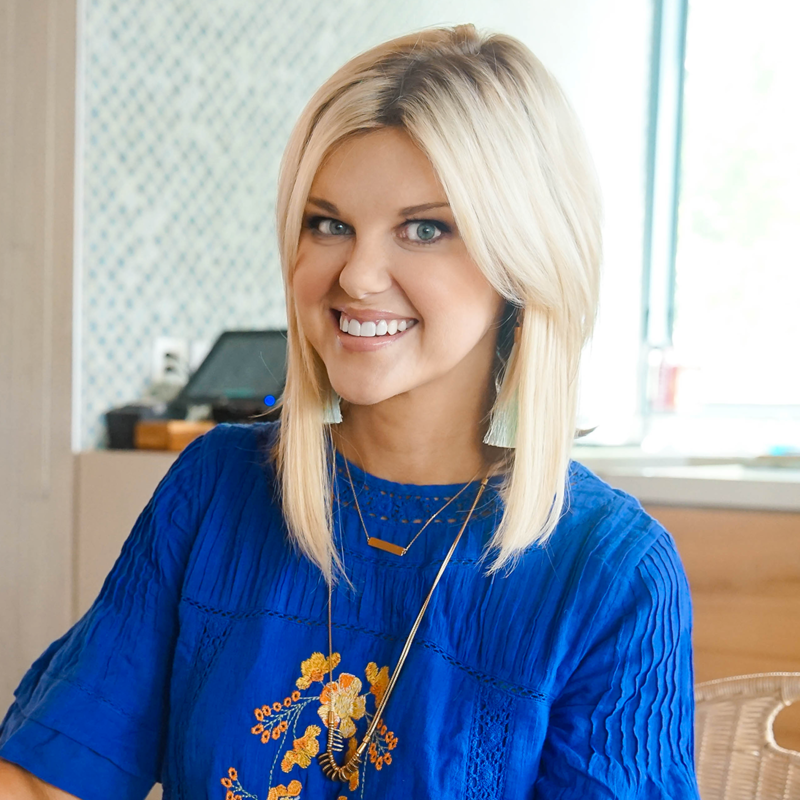 Using Krylon® Chalkboard Paint in Black, I applied multiple thin coats (2 to 3) to each charger and then let them dry. 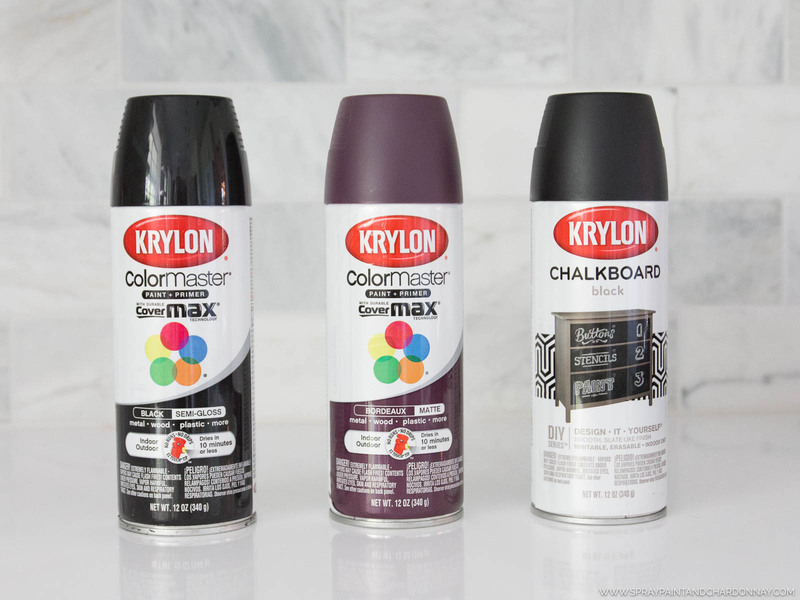 Unlike the ColorMaster Painter + Primer, the Chalkboard Paint is dry to the touch after about 15 minutes, but the can suggests that you let it dry for at least 3 hours before handling, and 24 hours before first use. I let the chargers dry in the yard for the recommended time (3 hours), and waited until the next day before I wrote on them. After the 24 hours of drying, I wiped each charger down with a damp paper towel to clean them off. 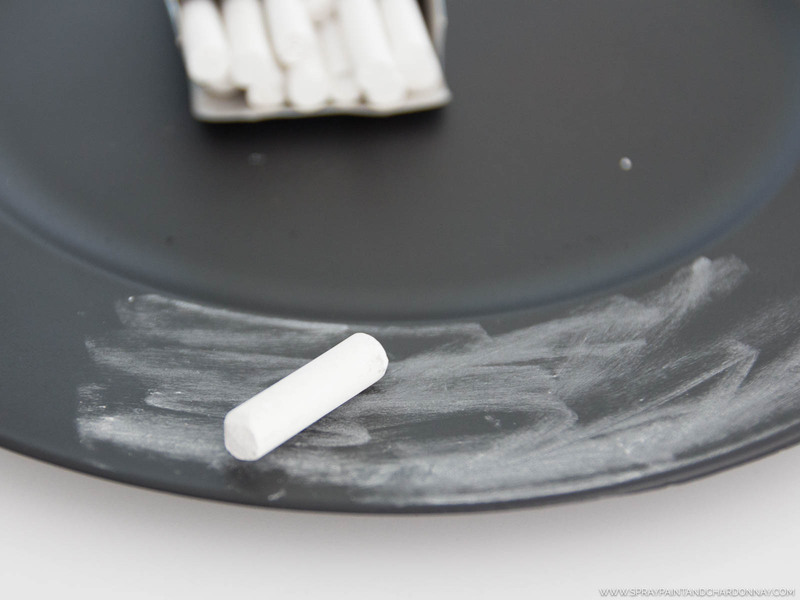 Once they were clean, I followed the instructions on the can and rubbed the surface of the chargers with the side of a piece of chalk to ‘break it in’ and then erased it, using another damp paper towel. To personalize them for my dinner party, I used a chalkboard marker and wrote “Here Lies (Enter Guest’s Name)” on the top of each charger, and “R.I.P” on the bottom. Haunting Hint: To make the letters look like bones, I drew teeny-tiny hearts at the end of each letter, like a serif. 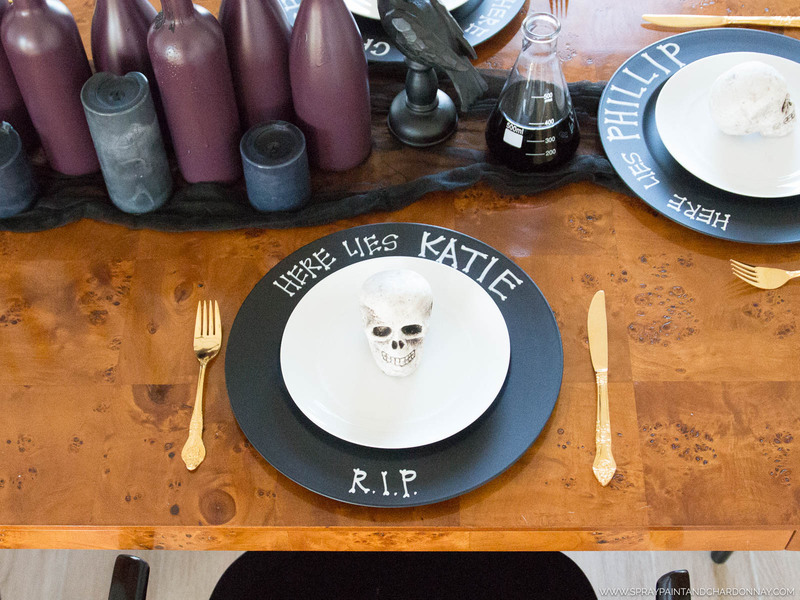 Since the painted surface isn’t food-safe, and food or drink should never touch it, I topped the chargers with a plain white dinner plate, and added little foam skulls that I found at Michaels in the center of the plate. 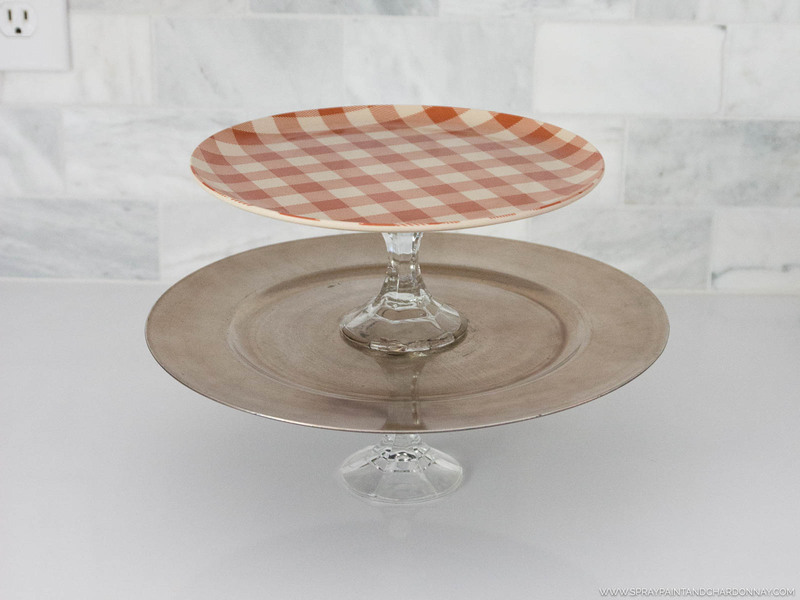 To create a creepy tiered cake stand, I rimmed the top of glass candlestick with a liberal amount of heavy-duty adhesive, and then centered the top of the candlestick on the back of a plate I had in my pantry. I repeated the process with the bottom of the other candle stick, and centered it in the top of the larger plate. I then added more glue to the top of the second candlestick and set a smaller plate on top of it. Once the glue dried, I sprayed the now tiered-stand with a couple coats of Krylon® ColorMaster Paint + Primer in Semi-Gloss Black. Like the wine bottles, the stand was dry to the touch after 10 minutes, and safe to handle after about an hour. 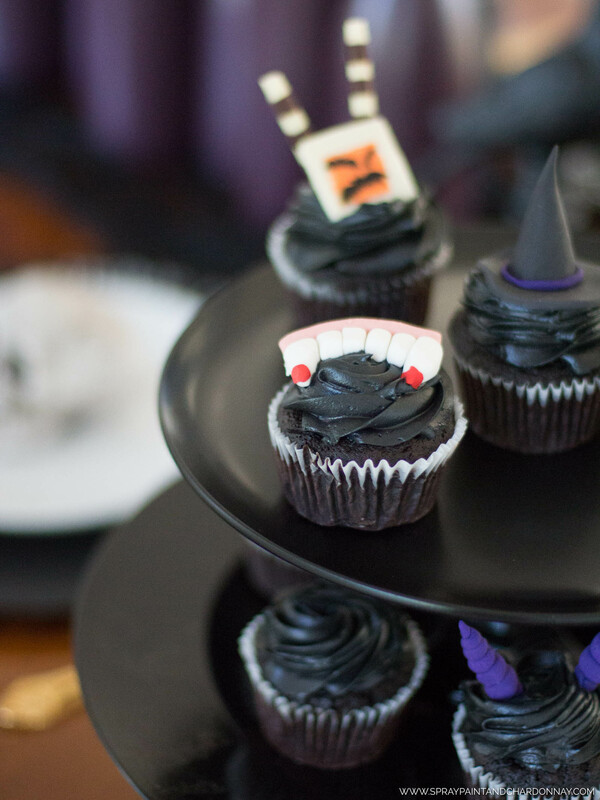 While I love a good DIY, I’ve never considered myself a pastry chef so I enlisted the help of a local restaurant to concoct these creepy cupcakes for my ghoulish gathering. 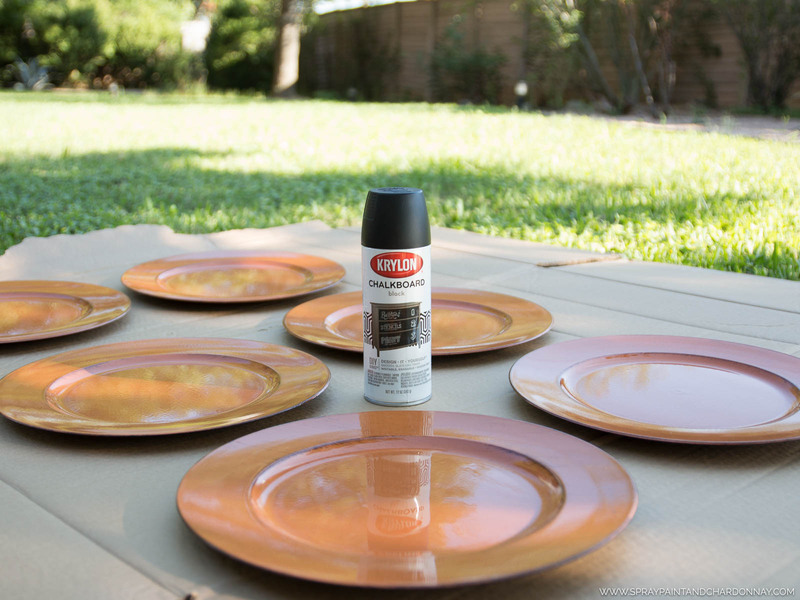 It’s important to note again that these spray paints are not food safe, so make sure that there is a barrier between your food and any of your spray-painted projects and surfaces. 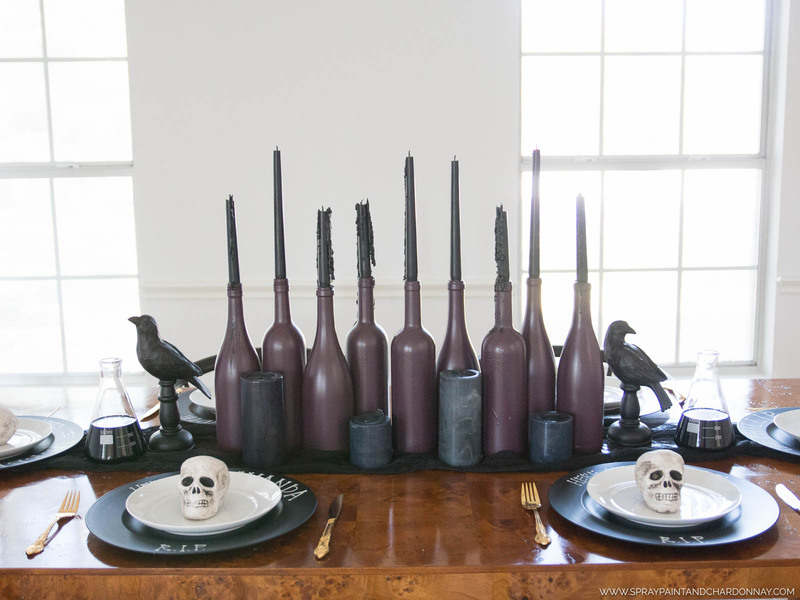 This Halloween tablescape was so fun to create and it only took a a few hours (not including the drying time for the chargers) to complete. 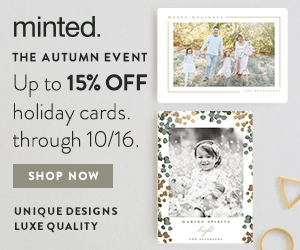 How are you decorating for Halloween?